The second part of DonPachi could be best described as "more of everything". There's more action, more details more playtime. Even the medals are bigger. In the second stage you are able to catch medals bigger than your own ship. Talking about medals: Besides the power-ups 'P' and 'B' for enhancing the strength of your weapons, there are bee medals hidden in the whole game. If you shoot where a bee medal is hidden, it starts to blink. Then you will need to use your laser to free it, before you can collect the medal. Hidden bee medals can be found in DonPachi also. btw. An interesting new feature in Do Donpachi is in the selection screen at the beginning of the game. Now you can set the balance between the shot and the laser weapon (see our review of 'DonPachi' for more infos on the weaponary). So if you prefer playing it old-skool (tapping the [A] button), you should choose the 'Shot' option which gives you more power for the bullet salves. In case you like more the "mowing" (holding the [A] button), you might select the 'laser' option which makes the laser stronger than the other gun. Like in DonPachi, the [B] button drops a nice smartbomb that will combine with the laser, if released while holding the [A] button. Otherwise it explodes in a more classical way and erases the enemies all over the screen. CAVE reused the basics of DonPachi's scoring system where you get combo scores for hits within a specific time range. If it takes too long for your next hit, the chain breaks and counting restarts. Speaking about time: The games has 6 levels instead of 5 like the predecessor and a second round. The music score is similar to DonPachi, but has more guitar sounds instead of strings and trumpets, what makes the music sound harder. 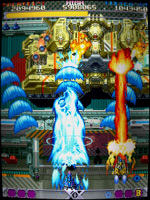 People like Bernard Doria (you will find a link to his brilliant conquest manual "bee preying" in the shmup portal of World-of-Arcades) and Aichi-Ken's insane replay movie have proven, that Do Donpachi has got a brilliant gameplay and it is really possible to finish the whole game without losing a single life. Needless to say, that this goal is almost impossible to reach, unless you practice for a very long time. Collecting CAVE games can be an expensive hobby and Do Donpachi is not only one of the most successful titles, it is still one of the expensive CAVE PCBs (depending on it's age). If you can't find the arcade PCB for a decent price fitting to your budget, you might consider a purchase of the Sega Saturn console port of this game, which is also quite good; at least gameplay-wise.